Moving to a new barn is not only stressful to your horse, but also for you. Bonds will be broken and new bonds made. Feed may change. Water may be different. Different diseases may be present. All of these things should be on your mind, and I will try to give you some pointers to help minimize the stress! Horses are herd animals. They are encoded to pack together for their own safety. They tend to make bonds with the horses around them and consider them part of the group, even if they are not all in a pasture together. When you disturb this bond, some horses get very upset. If you are moving and you have multiple horses, this may not be as big of an issue since they may be happy with just one or two others. If not, expect a few days of excessive vocalization and worry. You can discuss with your veterinarian the use of a product called Zylkene® that is made from colostrum. It is natural and makes the horse feel at home. Cold, wet weather presents a few challenges that can usually be mitigated with a few extra precautionary tips. 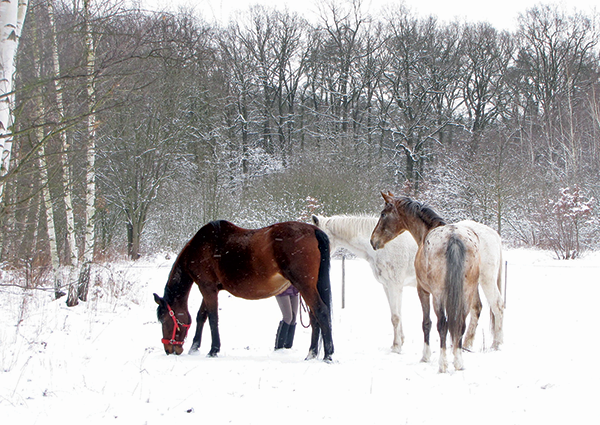 Horses are designed to be able to survive in a variety of climates, but through our manipulation and care, sometimes we impede their ability to thermoregulate in the winter time. Let’s discuss some key points on winter care. Arena footing comes in a wide variety of substrates. There are natural and man made materials used in their composition. In this article we will learn a few basics and then discuss some factors to look at from the veterinary side of injuries and their prevention. When selecting a footing for your arena, there are some factors to take into consideration. 1) Shock absorption: Shock absorption or cushion is going to take strain off of the legs of your horses. While they do have built in structures to help with this, anything you can do to aid can be beneficial. If you run on concrete you are more likely to be sore than if you run on grass! We had a question come in regarding strangles. This year, the American College of Veterinary Internal Medicine (ACVIM) came out with a consensus statement on this disease. I will go over the key items discussed and the bio-security measures they recommend. These recommendations apply to any outbreak of contagious disease, although each disease may have some minor changes. Strangles is a term used to describe a bacterial infection caused by the organism Streptococcus equi ssp equi. The common presentation is a respiratory disease with lymph node enlargement. Horses typically have a fever and severe nasal discharge. The bacteria starts to be shed in nasal secretions 2-3 days after the onset of fever and typically persists for 2-3 weeks. 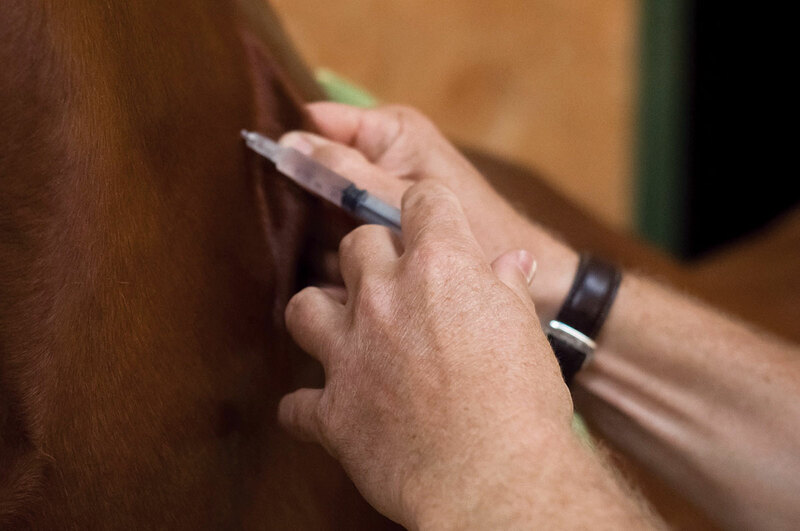 It is recommended that all recovered horses be treated as potentially infectious for six weeks after the resolution of purulent (pus) discharge. From 20-25 percent of horses recovering from the disease can become susceptible to a second attack of the disease. An average of 10 percent of horses will have a persistent infection in their guttural pouches, which are located in the throat area and can test positive from that area for months to years without showing outward clinical signs. These types of animals, healthy without showing signs, are thought to be more important in the spread of the disease as they are not recognized as sick. Fall is here, and it is a great time to visit on items to take care of on our horses. It is a great time as show season is slowing down and the temperatures are more pleasant. So, let’s go over some items to consider for the fall. First is vaccines—If you need Flu/Rhino boosters due to your situation, now is the most common time to get them. Dentistry—This is a great time of year to have those points removed and any abnormalities resolved. Going into winter, you want your horse getting the most from its feed. Lights—If you are planning on breeding in the late winter or early spring, you want your horses ready to go and cycling properly. Day length plays a role in both the mare’s and stallion’s reproductive cycle. Blanketing—If you do blanket, it is time to make sure they are in good order and depending upon wehre you live, time to start using them! As the year is winding down and we are getting into holiday season, do not forget some of the extra needs your horse may need this time of year. It is also important to make sure your horse’s housing in is good order. With wind, rain, and cold on the way, it is good to make sure any repairs have been taken care of and for those of us in areas that freeze, that our water heaters are functioning properly. Also, do not neglect the hay storage areas. Water getting on hay is destructive. Pests are looking for somewhere to set up shop. You need to protect your hay from water, rats, mice and rabbits. Hopefully this list stokes some ideas on things to get taken care of. Happy Thanksgiving! For most people, we are rounding the last corner and headed to the finish line for show season. Many equine athletes have been going hard all spring and summer. Keeping our horses sound and performing at their peaks takes some extra efforts on our part. I will try to touch on some key points that can be beneficial to keeping our horses happy and performing. First off is nutrition. When traveling, I would recommend keeping your horses diet as close to normal as possible. Take at least the supplements and concentrate feeds that you feed at home. If you can, take the same hay also. Changing diets on the road can lead to colic and lost competition days. While we are on nutrition, I feel it is really important to keep a performance horse on a good quality joint supplement and vitamin mineral supplement. You want their joints as comfortable as possible. You also want their metabolism working at its peak to give them the energy they need. Well, August is here and so is the heat. July showed us some very hot temperatures, but we still have the late summer and early fall heat waves to deal with. We have discussed most of this before, so here are some reminders. 1. The cornerstone to surviving this heat for our horses is water. Access to plenty of clean and cool water is essential. We all love our horses. We invest time and money into their care and upkeep. I think it is natural for us to want to protect the emotional and financial investment we have in our horses. This month I am going to discuss the various forms of identifying our horses. Each breed registry has its own method for identifying the animal for which they produce papers for. Pictures, written descriptions, and drawings are found on these different documents. They usually also include the parentage of the registered horse. The eyes are extremely important to our equine companions. If we lose one or both eyes, it can be career-ending for our animals. Signs of eye discomfort are blepharospasm (squinting), tearing of the eye, rubbing of the eyes, and changes in the normal appearance of the eyes. This month I will discuss some of the more common eye ailments I see and some tips on what can be done. Before we proceed, I feel I should mention that most eye problems should be seen sooner rather than later. Waiting can be devastating on some of these problems. Eyelid lacerations are extremely common. One Friday evening, I had three emergency pages back-to-back, all eyelid lacerations. If treated promptly, most can be sutured. If no tissue is lost, often times full function returns and there is little to no cosmetic defect. I usually give some sedation, locally anesthetize the skin and repair the laceration. A tetanus vaccine update and some antibiotics are often the only other medications needed. The uvea is the back part of the eye itself. Some breeds are more prone to the condition, but it is thought that an infectious agent causes the disease, although it cannot always be proven. This area in the eye gets very inflammed and can fill with pus. These conditions are very painful and can cause significant blepharospasm (squinting) and tearing of the eye. The eyes can get a bulging appearance to them and they can appear yellowed. These are many ways these are treated, but anti-inflammatories are very important to reduce the swelling and discomfort.